Home / Enter in QuiBids’ January Tweet-Off! Here’s your chance to prove that you’re the top QuiBids Twitter follower! 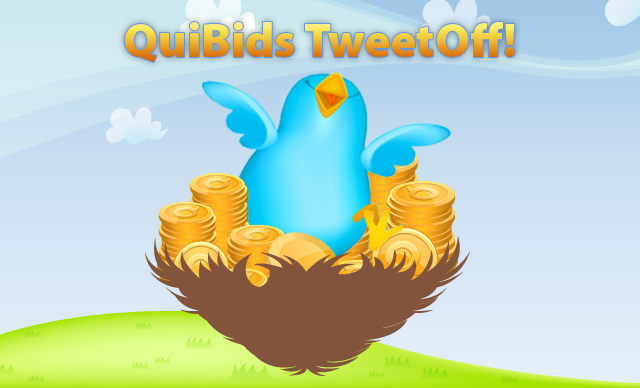 All this month we’re hosting the QuiBids Tweet-Off and one lucky winner will earn a $100 gift card of their choice! The more you tweet at QuiBids’ Twitter handle in the month of January, the better your chance of winning! It’s dummy-proof! Not that we’re presuming you to be dummies, it’s just set up that way to help us keep track of all these tweets. We’ve embedded a bunch of tweets below for you to respond to over the course of the month. Click the Tweet button and a template tweet will pop up for you to enter your own response. Don’t forget to remove the blank space, otherwise your tweet will be very difficult for us to find. Also, be sure to include the hashtag #QBTweetOff and to mention our Twitter handle (@QuiBids) to see what-all people are saying about QuiBids this month! Each tweet is considered a submission in the Tweet-Off, so the more you do it, the more chances you have to win. Avoid spamming your own Twitter followers by responding to each tweet no more than once a day. The QuiBids Tweet-Off ends January 31, so you’ve got plenty of time and chances to tell your Twitter followers all about QuiBids! We’ll announce a winner the first week of February. Now get out there and tweet like crazy, QuiBids faithful! And as always, happy bidding this month!